Electro Static Discharge (E.S.D.) is the number one leading cause of PC components “arriving” D.O.A. I am sure to get a lot of public outcry, but the simple fact is that it's the truth. How many of you have received that new motherboard, graphics card, or hard drive in the mail and immediately opened the package, and removed the device from its anti-static bag with your bare hands? By doing so you possibly have subjected that device to tens of thousands of volts of static electricity which may or may not have friend that expensive component's delicate circuitry. 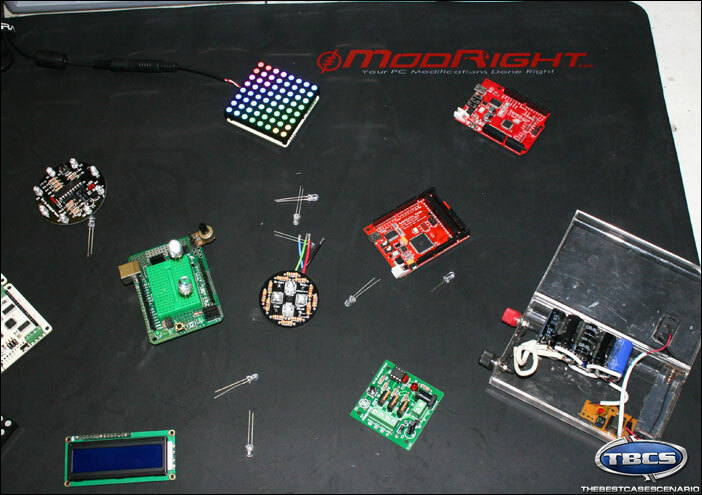 ModRight, a company dedicated to improving your PC modding experience has taken steps to solve the E.S.D. 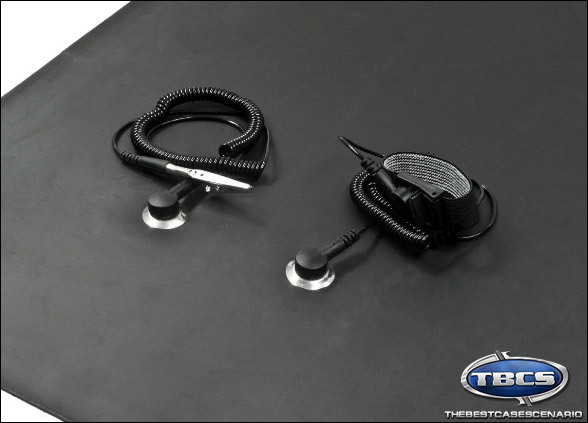 problem that haunts us all by manufacturing affordable anti-static mats for our bench tops. After the jump we will take a look at their largest model. 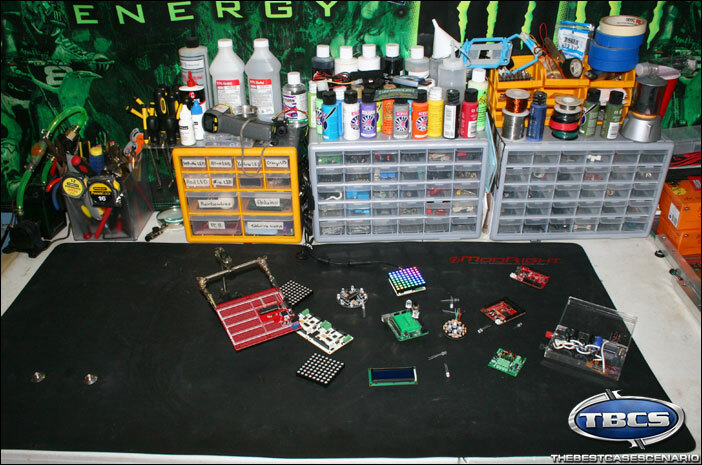 Being a product reviewer, I have hundreds of electronic gadgets come across my workbench every year, not to mention the components I purchase, and have yet to experience a product that was Dead On Arrival (D.O.A.) I contribute this to one factor...I have always used a grounding wrist strap when handling an E.S.D. sensitive product, building a PC or prototyping my latest electronic project. People have called me paranoid and crazy because of this, but while they were sending their gear in for RMA due to D.O.A, I was enjoying my new hardware. 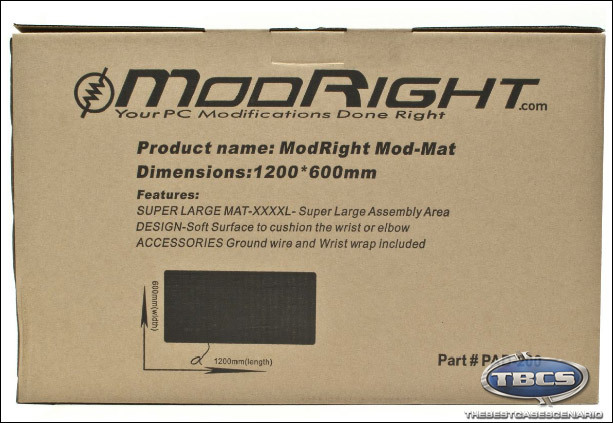 ModRight, a company known for its single braid PSU cables, fan filters, and modding mesh has just introduced a new line of bench top anti-static mats to keep your project and you connected to prevent any static electricity build-up. 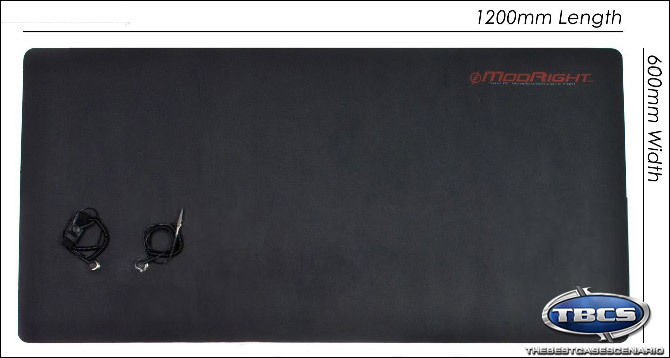 The Mod-Mat is currently available in one size: 47" x 23" and features a nonslip rubber surface and backing to ensure that your project and the mat stays where you place it. Also featured on every mat is an embedded set of two snaps that enable the user to connect a grounding wrist strap and a grounding clamp to the PC chassis you are working on. 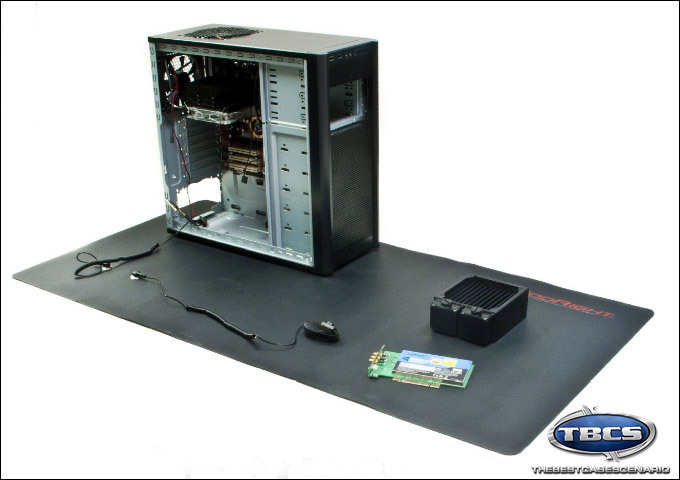 The box the Mod-Mat is shipped in even doubles as a reusable transport case because ModRight knows that modders tend to take their projects with them to friends homes, clients homes, or even to a local hacker space. Mark over at http://www.frozencpu.com asked me to take a look at the Mod-Mat since I am involved in both the PC Modding Community as well as the Open-Source Hardware community. I agreed and he sent me the Super Large Anti-Static Mod-Mat for testing. When it arrived, all I could say was “WOW this thing is huge!” I immediately removed it from its packaging and placed it in its new home on my main workbench. The Mod Mat must be manufactured from similar rubber that vehicle tires are because my modding room instantly smelled like a tire shop. The smell did not bother me as I once worked as a tech at an automotive shop and most of our parts stock was located in the tire warehouse out back, where I became accustomed to the scent of fresh rubber. For those of you who might be less receptive to the new tire smell, just let the Mod-Mat sit outside for a few hours, and the scent will be gone. Dimensions: 1200mm Length x 600 Width x 2mm Thick 47.24" x 23.62"x 0.78"
With the Mod-Mat in place I quickly got to work building my next project: a full-featured HTPC (article coming very soon). I instantly loved the anti-slip surface that the Mod-Mat creates. It’s a huge improvement over the hard, slick plastic surface that my bench is made from. I could finally place screws strait on the surface and not have to worry about them sliding to places unknown. 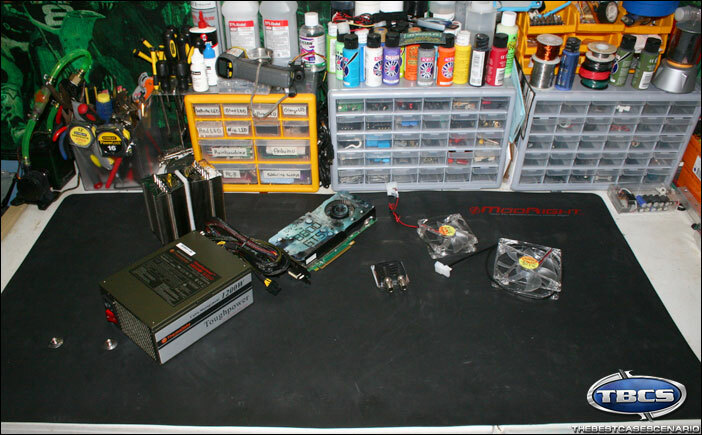 With my arm and the HTPC chassis grounded to the mat's surface, I was able place hardware components straight onto the Mod-Mat’s surface and not have to worry about them getting fried. That really sped up the build time and removed the clutter of having several anti-static bags or foam laying everywhere. I placed the motherboard, GPU, RAM, and CPU solder side down straight on the Mod-Mat's surface. My socked feet were constantly brushing over the floor's surface while sliding back and forth in my desk chair. In theory this should have created a static buildup on my skin, but because I was tethered to the Mod-Mat and the HTPC chassis via the wrist strap, any static that may have been generated was quickly dissipated. I feel that the ModRight Mod-Mat is a tool that every modder and hacker should own. 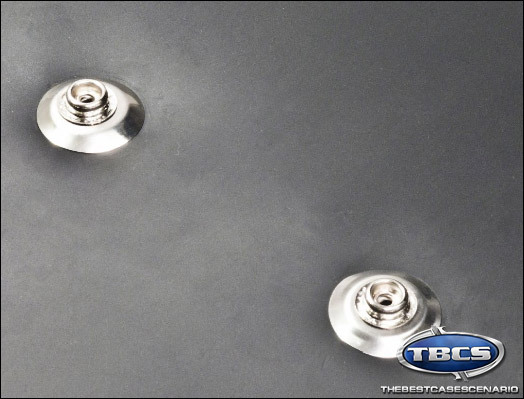 It prevents lost time due to E.S.D., protects those one off electronic projects, and provides a superior nonslip surface that other traditional materials just cannot. During my 2 weeks of testing, I have placed over $3,000 worth of hardware on its surface including some very E.S.D. sensitive ICs, and none of it was damaged. The ICs tell the real tale here. 2 of them would have been damaged with just a few volts of static electricity, but they were undamaged even during bare hands handling while grounded with the wrist strap. This proves that the Mod-Mat is doing its job. Similar anti-static mats of this size run in the $90 range, making the ModRight Mod-Mat a very good deal. For these reasons, I am awarding the Mod-Mat our 5/5 rating and recommending it to everyone who builds PCs or Electronics. This product was provided free of charge, by it's manufacturer for the purpose of review.